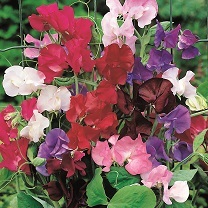 “The ultimate sweet pea mix to grow every year. I’ve selected early, mid and late season varieties to keep you in beautiful blooms all summer long. 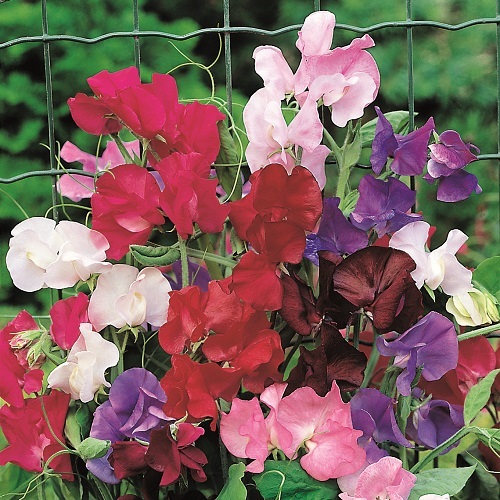 Ranging from 1.5-2m (5-6’6”), in solo and bi-colours, with stripes and flecks, plus a stunning bright red, ‘Rob’s Perfect Summer’ is highly scented, conjuring the image of a quintessential British summer and filling your garden with blooms. Try growing ‘Rob’s Perfect Summer’ through a rambling rose, or up the side of an evergreen bush to add colour and scent.” Height 1.5-2m (5-6’6”). Sow January-March under glass in gentle heat or in April-May outdoors in well raked, warm, moist soil for flowers June-September. Can also be sown in September-October in a coldframe or greenhouse to overwinter in frames to produce earliest blooms. Use root trainers or similar tall small pots and add 2 seeds per module, or 7.5cm (3") pots with 3 seeds in each, to start them off. Plant out when 'hardened off', 15cm (6") apart. Don't forget to pinch the tip out of each plant at 15cm (6") tall, this makes each plant fill out more. Ideal for beds and borders, climber. Suitable for cutting. Scented.